This knife is for people with small hands, women, and mature adolescents. It can be used for small outdoor chores or cheese, fruit and small food chores. It has a carbon steel blade, and a curly birch handle. Brass bolster, fibers spacers, and moose or reindeer bone. This knife is an all purpose puukko. It can be used for outdoor chores, hunting, hiking and just about anything else you use a knife for. It has a carbon steel blade and curly birch handle. The handle has a brass bolster, fiber spacers and moose or reindeer antler. This puukko is a great all purpose, hunting or utility knife. The tapered blade makes for a great hunting knife design. The blade is carbon steel and the handle is curly birch that has been stained dark brown. The handle has a nickle silver bolster and pommel. The handle also has black and red fiber spacers and reindeer antler. This puukko is another good all purpose knife for lighter chores. It can be used for hunting, utility work, hiking and food preparation. The blade is carbon steel and the handle is stacked leather. The handle has a brass bolster and pommel. The handle also has two brass spacers on the pommel end. 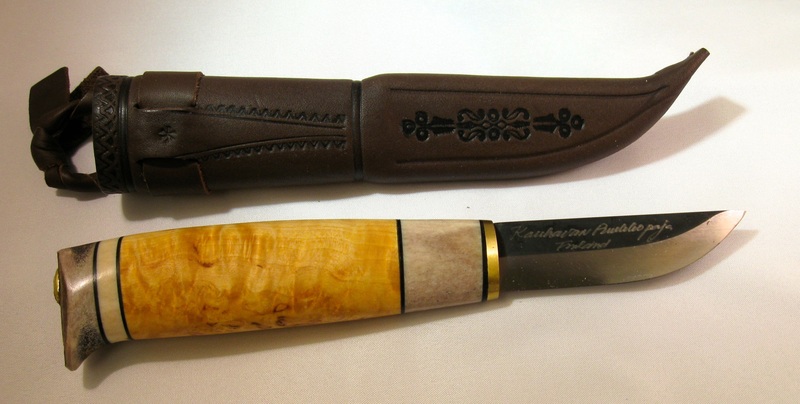 This puukko is a great all purpose, hunting or utility knife. The blade is carbon steel and the handle is stacked leather. The handle has a brass bolster and pommel. The handle also has two brass spacers on the pommel end. 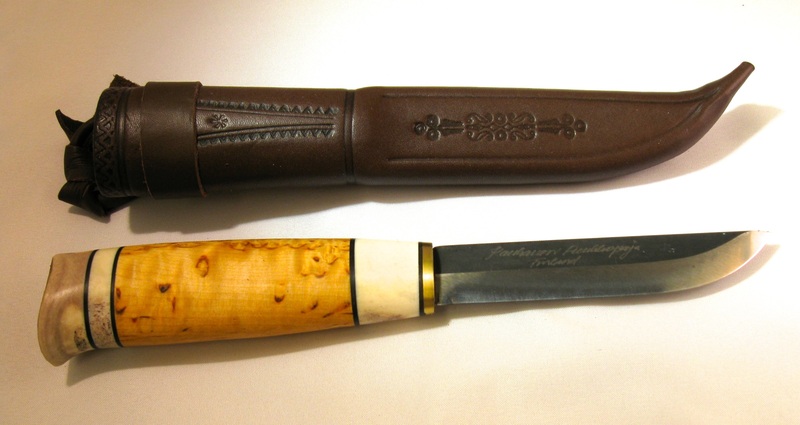 This puukko is used for hunting and as an all purpose utility knife. The blade is carbon steel and the handle is stacked leather. The handle has a brass bolster and pommel. The handle also has two brass spacers on the pommel end.